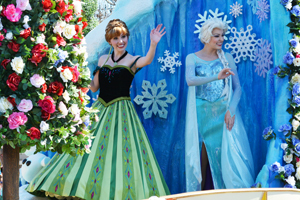 Elsa and Anna from Disney’s FROZEN (below, left and right) wave to guests – Princess Anna is in her Coronation gown! 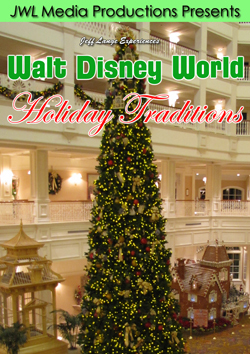 Olaf stands next to them in this winter wonderland. 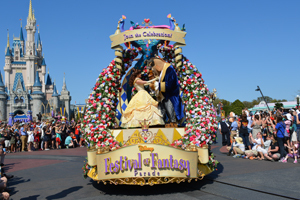 This float segment turns to feature Princess Tiana and Prince Naveen. 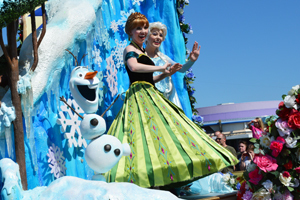 Video #1 – Anna, Elsa and Olaf from FROZEN debut in Disney Festival of Fantasy Parade Extended Version – Anna, Elsa and Olaf are in Disney’s Festival of Fantasy Parade at the Magic Kingdom – we posted a video from yesterday, this is an extended version with 2 days worth of Anna and Elsa from both sides of the street! 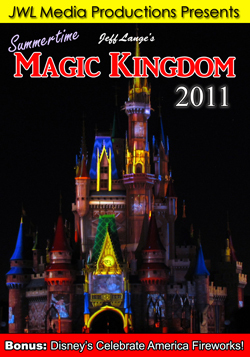 Anna is in her coronation dress. 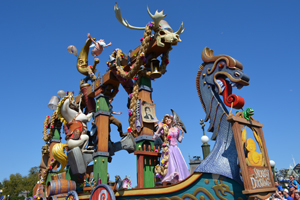 The Tangled float includes the mime from the Snuggly Duckling (below, left). 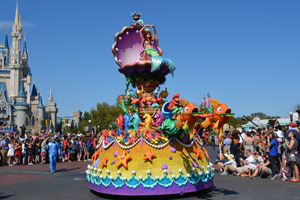 Rapunzel stands in front of the float, with her hair winding it’s way throughout. 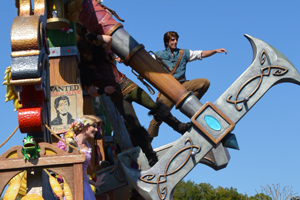 The float itself is elaborate, with swinging weapons that Flynn Rider and the ruffians swing on (below, left)! 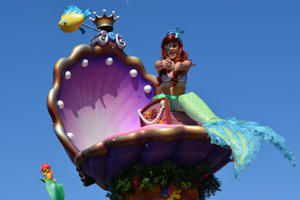 And Little Mermaid Ariel (below, right) sits in her clam shell, trying to comb her hair with a dinglehopper. 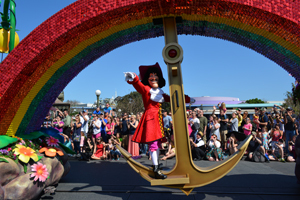 Ariel shows us her dinglehopper (below, left). 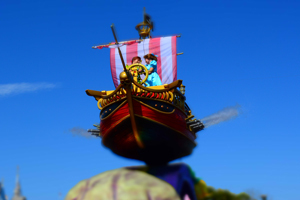 Peter Pan and Wendy navigate a boat atop Skull Rock (below, right). 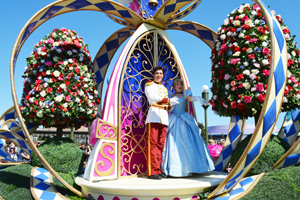 Peter Pan and Wendy seem to be enjoying their first day as part of the new parade, as was everyone else (below, left). 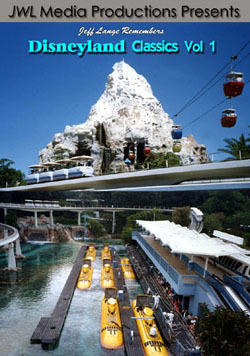 Captain Hook swings below (below, right). 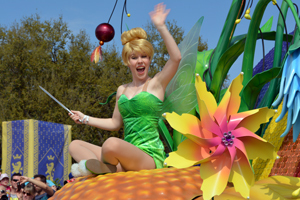 Tinker Bell waves to us from the back of the Peter Pan float (below, left). 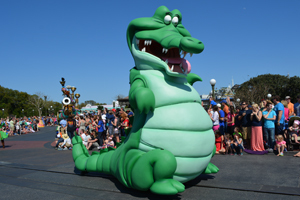 Tick Tock Croc trails behind (below, right). 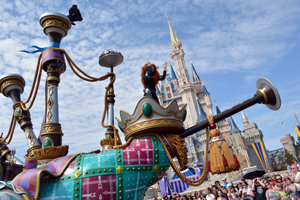 Princess Merida stands atop the Brave float, which is a set of bagpipes. 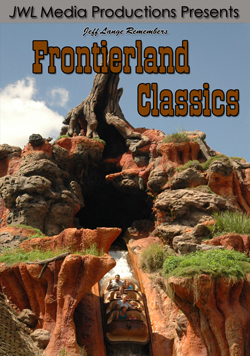 Can you see one of her three bear brothers looking down? 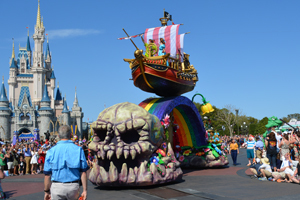 All three play “peek-a-boo” on the float (below, left). 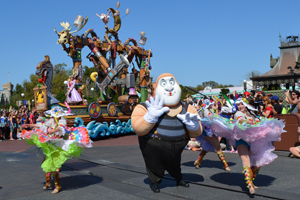 The three fairies also make an appearance – on the second day, they were practically floating down the street (below, right). 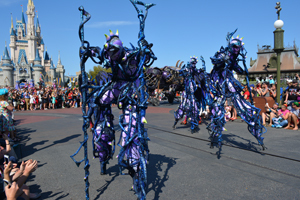 As part of the Sleeping Beauty segment, these stiltwalkers appear to menace the crowd (below, left). 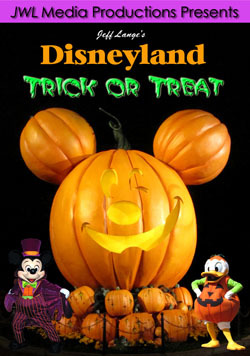 They are beautifully costumed, as is everyone else in the parade! 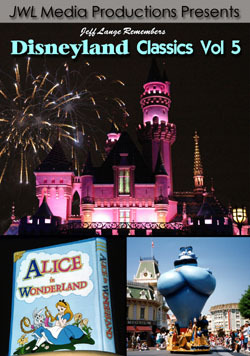 Maleficent (below, right) drew gasps when the fire was released. 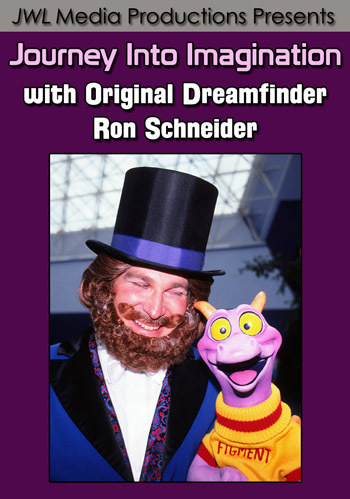 Video #2 – Festival of Fantasy Fire Breathing Maleficent Dragon In Sleeping Beauty Segment, Magic Kingdom – Maleficent breathes fire in this Sleeping Beauty Segment, which includes the 3 fairies, Prince Philip and some great characters! 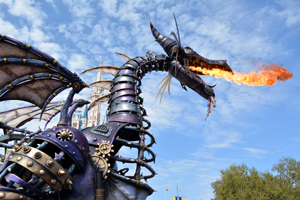 Maleficent as a dragon is steampunk. 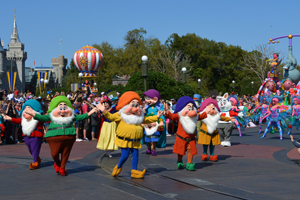 The Seven Dwarfs make their way down the parade route with Snow White (below, left), including Dopey sitting on Happy’s shoulders. 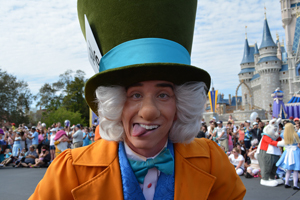 The Mad Hatter (below, right) is part of the Alice in Wonderland character set. 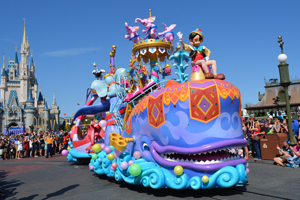 Pinocchio sits tall on top of a colorfully designed Monstro the whale (below, left). 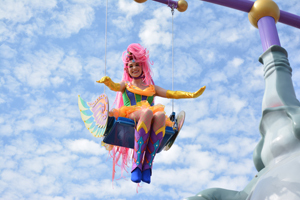 A performer swings above the crowd (below, right). 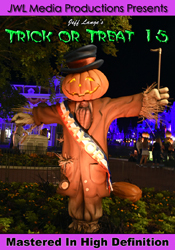 There is always something going on in the parade, both down below and above! 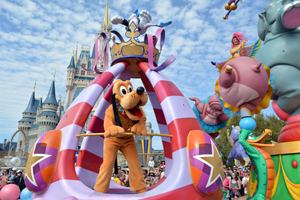 Pluto greets the crow from his float (below, left). 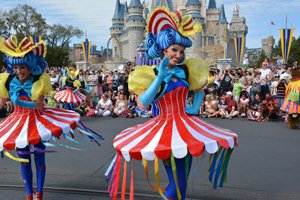 A Cha-Cha Girl waves, in a dress inspired by a circus big top (below, right). 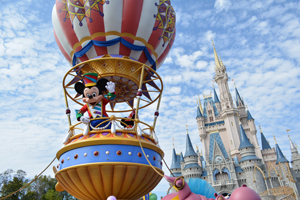 Mickey Mouse seems to soar above the crowd in his airship (below, left). 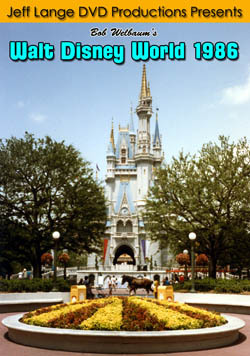 Minnie is waving to the crowds behind him. 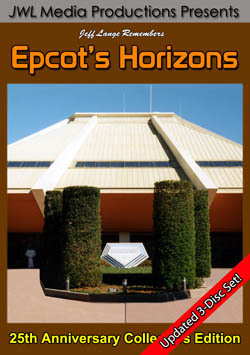 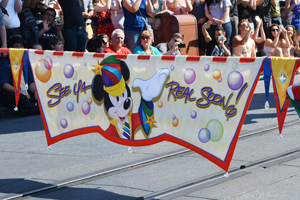 The final banner ends with “See Ya Real Soon”, but you have to look back to see it (below, right). 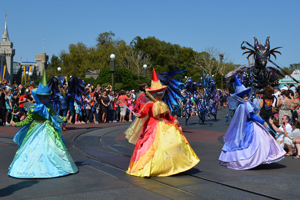 Video #3 – FULL Festival of Fantasy Parade at Magic Kingdom w/ Anna & Elsa, Fire Breathing Dragon, Disney World – Disney’s Festival of Fantasy Parade debuted at the Magic Kingdom today! 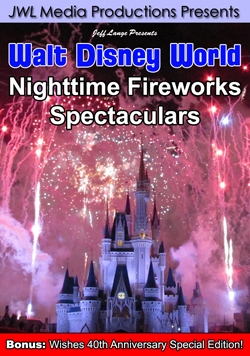 See Maleficent breath fire, Olaf, Anna and Elsa from FROZEN (Anna in her coronation gown), Rapunzel and Flynn Rider, Ariel, and a lot of wonderful floats!